Margaret Vermette developed a passion for musical theatre while she was studying for her PhD on George Eliot at King’s College, London. 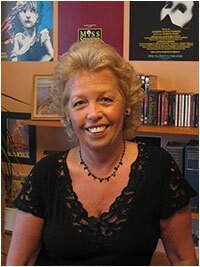 Margaret first went to University as a mature student, while still having three teenagers at home. Her first degree in Literary Studies, at Portsmouth, was followed by an MA in Victorian Literature at King’s just before she began her PhD. Margaret also teaches English as a foreign language and was Director of Studies for many years at a language school in Worthing. Margaret lives in West Sussex with her husband Mike and has three grown up children and three grandsons and a grandaughter. She enjoys spending time with her grandchildren, visiting art galleries at home and abroad, travelling, reading avidly and watching Formula 1. Margaret goes to the theatre as often as possible and loves Shakespeare, Greek Tragedy and new plays as well as musicals.